Al Winn joined McDonnell Douglas in 1984, shortly after the first production AH-64A model Apache emerged from the former Hughes Helicopters Inc. factory in Mesa Arizona. Today, as vice president of Apache Programs for The Boeing Company, he leads the team that engineers, manufactures, markets, and sustains the Apache Longbow worldwide. Over nearly 40 years in the US government and private industry, Mr. Winn has participated in the evolution of battlefield helicopters and the engineering tools that design them. Mr. Winn earned his master’s degree in aerospace engineering from the University of Southern California in 1974. After 10 years at Edwards, he transferred to the then-Army Aviation Research and Development Command in St Louis. There, Mr. Winn became the lead engineer on the Black Hawk program and helped bring the Utility Tactical Transport Aircraft System to production. He subsequently filled the same position in the AH-64 Advanced Attack Helicopter program. Before the Army withdrew from the Joint-service Vertical Lift (JVX) effort, Mr. Winn helped launch the program that led to the V-22 tilt rotor. He co-authored the first Army Aviation Modernization Plan and started the Light Helicopter Experimental (LHX) that morphed into the RAH-66 Comanche. The Light Helicopter program brought Al Winn to Mesa and private industry. 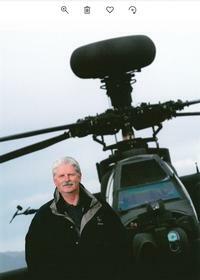 “When I came here, I was working on the LHX program as a technology lead.” When McDonnell Douglas and Bell lost the competition to build a low-observable scout/attack helicopter in 1991, Mr. Winn went on to manage advanced configuration design and AH-64 product definition and became director of Apache Longbow engineering. He was appointed vice president of engineering at McDonnell Douglas Helicopter Systems in 1992. The tools developed for Block I Apache Longbow modernization and refined through Block II now take Boeing systems engineers from operational to design requirements faster. Mr. Winn notes, “Simulation up front has made a tremendous improvement in defining the detail design requirements that you need to put in so that the crew can work effectively with the equipment on the airplane.” Cockpit symbology and other changes are now validated before they fly. “We know they’re right because we’ve flown them in simulation,” observes Mr. Winn. The revolution in computer design tools and simulation now extends to the Block III air vehicle. The Block III AH-64D introduces a split-torque face gear transmission and advanced airfoil composite rotor blades. However, Mr. Winn notes, “The number of people, engineers and so on, that are doing the design is less than on the original Block II and less than the A-model Apache. The reason for that is the capability of the toolsets that we’re using today. . .
Block III initially remanufactures Block I AH-64Ds, helicopters already remanufactured from AH-64As. Mr. Winn nevertheless believes the technology of the Apache remains competitive. “Much of the capability of the Apache is based on its survivability. It’s a brute. It can go out there and take fire better than any aircraft. That’s associated with redundancy and other design concepts. It also stems from high-hardness steels in many critical components. . . Those materials are still the best materials to use for their applications. After Block III, Boeing looks to a composite tailboom, vertical fin, and horizontal stabilizer to trim the weight and optimize the center of gravity of future Apaches. Fly-by-wire controls that were too expensive for today’s remanufacturing program may make new AH-64s more responsive and further reduce pilot workload. Boeing Mesa, using independent research and development funding, worked with DARPA, the Army, and other sponsors through co-operative Research and Development Agreements, Commercial Operations and Support Savings Initiatives, and other vehicles to advance Apache Technologies. The innovative relationships provided a portfolio of technologies for the Block III AH-64D. The Army and other traditional US government research sponsors are today focused more on mission systems than fundamental rotorcraft research. “Years ago, the tilt rotor concept came out of advanced concept programs sponsored by the government. We haven’t had any kind of program like that in a number of years.” says Mr. Winn. “We don’t have what I’d call a national investment to continue to advance rotorcraft-type technologies. . . Other countries are continuing to and starting to invest more in that area. Down the road it could be a problem and the US could fall behind.